In a large bowl, whisk together flour, baking powder, soda, cinnamon, oats, and brown sugar. Add applesauce, oil, eggs, and milk; stir until just combined. Mix in raisins. Spread batter into prepared pan. Bake for 55 to 60 minutes. Remove from pan immediately, and cool on a wire rack. Very easy and delicious! Also, I cut back the amount of oil and used only one egg and it still comes out moist, delicious and lower in fat. This is a nice desert but far from a bread. Like a apple crisp just a lot more moist. Very sweet for the kids surger shock!! Very tasty. 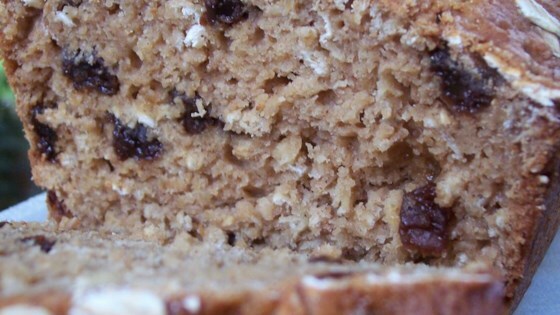 Would be good without the raisins and maybe some shredded apple. This bread is very moist. You would think there was more oil in it. I will be making this one again for sure, maybe adding some grated carrots next time. This was so easy to make as part of a gift platter. I did not have quick cooking oats so I pulsed normal rolled oats in a blender until very fine and that worked well as a substitute. Loved this recipe. very quick, very tasty. will make it again and again. kids loved it too!! not too sweet. we cut it while it was still warm and had with a nice cup of tea.